Leon Barnett says he is delighted to commit his future to the Cobblers for a further 12 months at least - and admitted he felt he ‘owed a bit more’ after a frustrating first season in the claret and white. 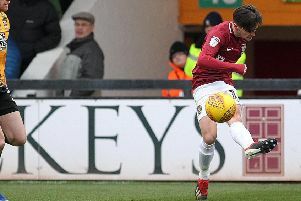 Signed by Justin Edinburgh from Bury last summer, Barnett endured a stop-start campaign due to injuries and then non-selection, with the team being relegated from Sky Bet League One. The 32-year-old made just 16 starts and two substitute appearances for Town, with 13 of those coming in the opening six weeks and then the final month of the campaign, when Dean Austin selected the former Norwich City man in all five games he was in caretaker charge. Offered a new deal by Austin at the end of the season, Barnett has decided to put pen to paper on a new one-year deal, with the option of another 12 months, and he is happy to have done so. “I am delighted, and it’s great to get your future sorted out,” said Barnett. “I played here a bit last season, and I felt like I owed a bit more, and hopefully I can play more next season and be more positive. Injuries were an issue for Barnett last term, with an Achilles problem picked up in September a major concern, but once he was fit he was left on the sidelines by Jimmy Floyd Hasselbaink. And the player is hoping he will be able to get more game time in the forthcoming campaign. “I try to do my best every game, if selected, and I will always work as hard as I can,” said Barnett. “All I can do is get on the training pitch, do the hard work, and if I am picked on the Saturday I am happy and will try and do my best for the team. “Every player goes through stages where they are injured and can’t play, and I think last season was a prime example of that.